Where to eat and what to eat? Tacos on tacos on quesadillas on soups and more! Mexico’s variety of food offerings and flavors makes it one of my favorite destinations. The mix of sauces and spices makes for a little adventure every meal, even if you order the same thing as another place can make it different. Arguably one of the best cuisines in the world, Tulum and Playa del Carmen offer some delicious choices for those on a budget or those willing to splurge. You could spend days just hopping from restaurant to restaurant in Tulum Pueblo, Tulum Beach and Playa del Carmen. There’s something for everybody, so here’s a guide to all of your foodie needs when visiting both Tulum and Playa. This is hands down my favorite taco spot in Tulum! For only 40 pesos ($2.10 USD) you can get a plate of 4 tacos of your choosing. In addition to meat options such as beef and chicken, there are also vegetarian options. For an extra kick and cost, add their fresh cheese to top it all off. They are delicious either way, and you have a short buffet of sauces and spices to add to the flavor. If you go nowhere else, go here!! 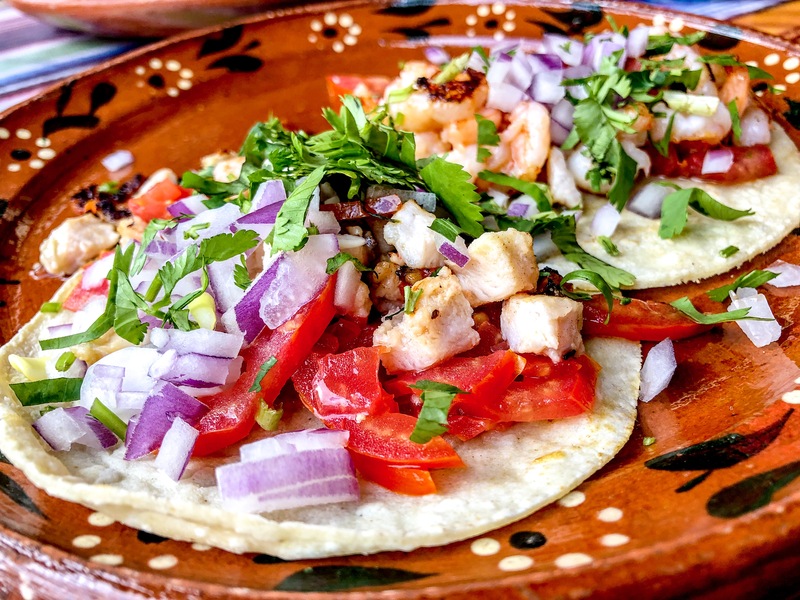 Located on a side street about a few blocks away from the Tulum city center, Tacos Kukulkan is an underrated standout. I only found it because my hostel was located outside the center of Tulum, but still close enough to walk to reach the touristy strip of restaurants and shops! I’m convinced the best foods are in the pueblo. The tacos were some of the best I had between Tulum and Playa, which is why it can get jam packed for dinner. The live music only adds to the already infectious atmosphere of locals and tourists. A little on the pricier side compared to the previous two options (but not unreasonable), Tre Galeones brings a little of the Tulum Beach to Tulum Pueblo. With a bohemian ambiance, the tacos here are oozing with flavor, spices, and sauce. Plus, with a 2 for 1 deal on mezcal margaritas, Tres Galeones has an impressively relaxing atmosphere in the heart of Tulum’s busy city center and nightlife. Walking behind the touristy Tulum sign around 9pm and you’ll find the street food you’ve been yearning to try! The street food is all budget-friendly, can be a snack before a big dinner (or the entire thing), and has a ton of flavor. From churros to elotes I am a big supporter of street food, and Tulum did not disappoint. It’s one of the many reasons why I love Tulum Pueblo. It offers a feel for local culture and great food to eat. I scarfed this down so fast. Though I stayed in Tulum Pueblo, there are still a ton of options to choose from in Tulum Beach. Food is just everywhere here! Tulum Beach definitely has more vegan, Westernized, and boho versions of traditional Mexican food, such as deconstructed tacos, acai bowls, brunches, etc. So if you want to mix up tradition with trendy eats, you will love Tulum Beach and the eco-hippie paradise it is. One of the many options in Tulum Beach, Coco Tulum had a savory and spicy shrimp ceviche that made my mouth DROOL. Especially for a completely random stop to eat at Coco Tulum. This was a special of the day (along with two beers that I all split with my friend) and it was worth the extra pesos. Total it was 380 pesos (roughly $20 USD, so not exactly budget friendly) and my splurge meal of the trip! Tacos galore! La Eufemia is a laid back restaurant right on Tulum Beach with tasty tacos to help you relax. You can eat at a table or claim one of their beach chairs to lay out, eat, and drink. They are more expensive than tacos in Tulum Pueblo, yet I enjoyed them all the same. I went to La Eufemia on my first trip and I was excited to get back to eat there again. To be honest I went to I Scream Bar because I thought it was super cute on Instagram. No shame. However, the ice cream was refreshing on a warm day. I Scream offers a nice mix of flavors, and feeling a little bolder I chose the coconut flavor. As a normal anti-coconut person, I was pleasantly surprised. The bartender and other workers there are also super chill and have some of the best stories. Go and talk to them yourself, all while indulging in some ice cream. Prior to going to Playa, I resumed my normal planning mode of finding some spots to eat. To be honest I didn’t find much so I was a bit nervous that the food scene wasn’t that big in Playa. Fortunately, I was proven wrong and found some key spots. I’ve highlighted them below! While researching food recommendations in Playa, El Fogón seemed well-received. It’s further back behind the Wal-Mart and away from the touristy 5th Avenue, yet I wished I ate here more than once! The food was reasonably priced (of course) and had cactus on the menu, which is something that’s outside my personal palette. But, I knew I wanted to try it and I loooooved it a lot. Definitely go here on your trip. When in doubt of where to eat? Ask someone from the area (if not a local, at least an expat who may be more familiar with the area). After checking-in to my hostel in Playa del Carmen, I asked people in my hostel of places to eat lunch. El Rancherito was a mentioned a few times, so I decided to check it out. I ordered my favorite fish and shrimp tacos (hint: it’s a pattern by now), and having them grilled was a welcomed change of pace. Located off the beach area, La Perla Pixan was the perfect location to get some crab soup. It had just rained and I was itching for some hot soup. I was taco’d out and the herbs and spices in this soup fed my soul. La Perla’s menu had something for everybody, including grasshoppers! The service was also excellent, with a waiter who was eager to explain anything we didn’t understand. Yes, street food again! This time was by chance as I stumbled upon a Oaxacan market a few streets back into the less touristy area of Playa. Tons of people seemed to find it too as it was packed with locals and tourists. The tortilla of my quesadilla de comal was the freshest I had thus far. Also, the menu was more traditional than fish and shrimp tacos. So for travelers looking for traditional Mexican cuisine that is regional-based, street food may be for you. For those longer beach days, packing a lunch may be the best option to prevent losing your perfect sunny (or shady) spot. Bringing food is great, but don’t forget there are snacks available for purchase. Locals walk up and down the sand (particularly in Cancun and Playa del Carmen), selling fruit with spicy sauce, churros, chicharrones, and other treats. At only 40 or 50 pesos, they’re budget friendly and delicious. If you travel for no other reason, travel for food! It’s a great way to understand a new country and its culture. You can also order the same thing multiple times, like fish tacos or shrimp tacos, and each place will make it differently. Though I loooove tacos, in case you couldn’t tell by how many I ate, there are a variety of options to choose from. Tulum and Playa del Carmen have restaurant menus (and street options) full of flavors and tastes to explore. Book the flight and they’ll handle the rest. Thanks for reading! For more foodie posts, PIN this one for later!